Trade Union Left Forum Home / News / Debt, inequality, and industrial action: The chicken or the egg? Trade unions remain the most tangible and most effective way to reduce inequality. Unionised work-places tend to have fairer, more transparent and more equitable pay models, which provide pay increases year by year for workers above inflation. They redistribute wealth from the surplus value created by workers that would otherwise go to profits (or dividends and executive pay) to workers’ wages. However, as unions have weakened, and union density throughout the economy has weakened, all workers have suffered. Low pay has become more prevalent, inequality has grown, and contracts have returned to the more “flexible” model of the nineteenth century. 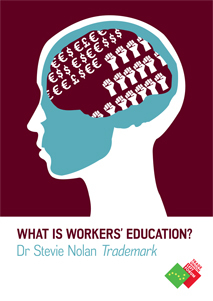 There is no one reason for the weakening of the trade union movement. Much has been written about the partnership model, the neo-liberal offensive of the last five decades, and more recently offshoring, monopolisation, and the global labour arbitrage. But there are three interrelated factors in Ireland that, while not direct cause-and-effect phenomena, are most certainly related and reinforcing, creating a self-fulfilling cycle. 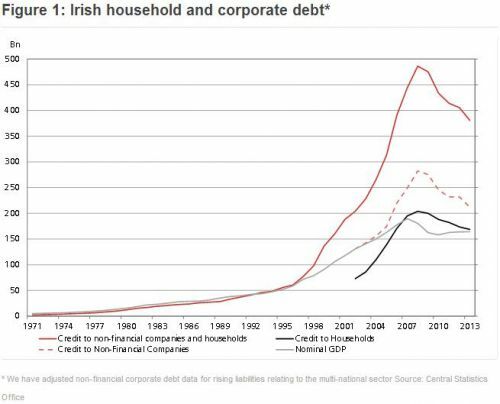 These are household debt, growing inequality, and declining industrial action and union density. The following graph, showing income and union membership in Britain, has done the rounds on social media, sparking much comment and debate. But what does something similar for Ireland (south) look like? It is well documented that household debt, most significantly mortgages, has been on the increase in Ireland for some time and most markedly from the mid-1990s on. 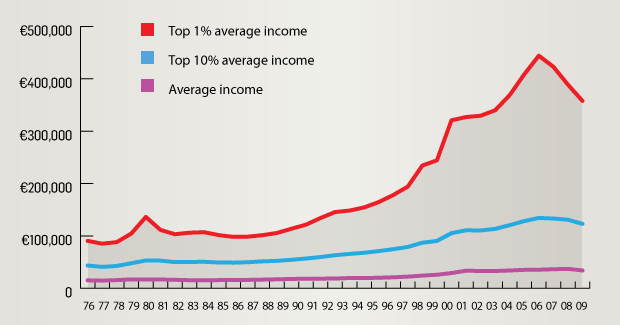 The two graphs above demonstrate this, firstly in money lent and secondly in the ratio of debt to disposable income. But both clearly show the increase. 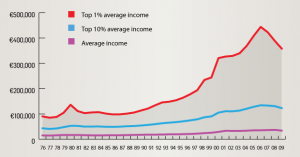 While the average income of the top 1 per cent has grown fourfold and of the top 10 per cent significantly, the average income has not grown at the same rate but has largely stagnated, while at the same time house prices were rocketing. 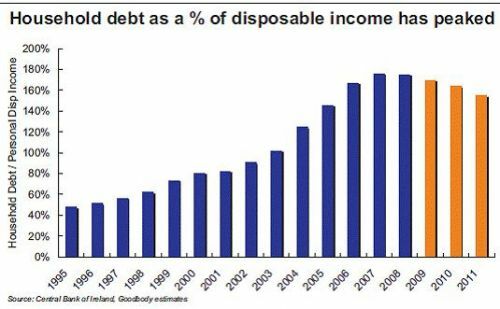 Obviously, if average incomes stagnated in the 2000s and house prices increased, then household debt will climb, as shown above. 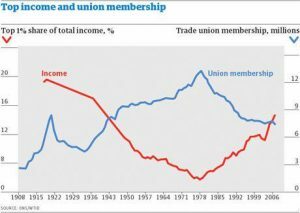 Although power can be measured in many ways, union density and industrial action are strong indications of union power in society; and both have been on the wane since the early 1980s. 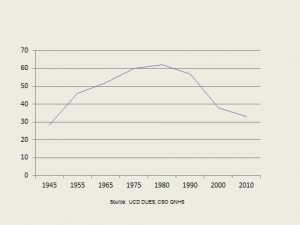 The graph above shows union density peaking above 60 per cent of the work force about 1980 and then declining each year to just over half that, at between 32 and 34 per cent today. 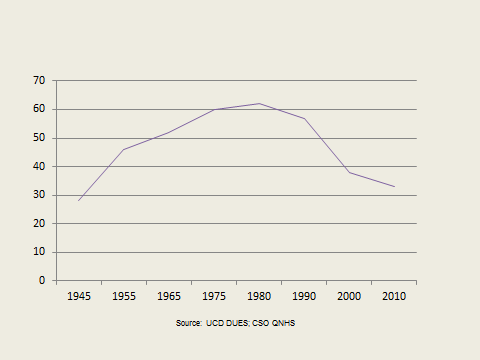 Using the CSO’s series of measurements of days lost, number of workers involved, and number of firms, going back to 1985, again we can just about see that, on all measurements, industrial action has been declining from the mid-80s to today, with a slight peak in 2009 as a result of action in the public sector, and again we will see a peak in early 2017 when the series are updated. One might be tempted to ask, Which came first, the chicken or the egg?—but please don’t. It isn’t that simple. 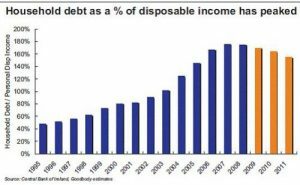 But there certainly is a reinforcing relationship between rising household debt and the hold this has over workers, making it much harder to take industrial action and risk losing pay. This then contributes to weakening union power, meaning that a greater share of all wealth created by workers goes to the elite and top earners.